Lee Sang-Ki named president, Kang Seok-Jae sec. gen. 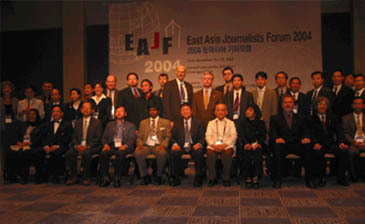 Participants in the 2004 East Asia Journalists Forum pose after the third presentation session at the Korea Press Center in downtown Seoul on Nov. 18, 2004. The forum drew about 60 journalists from 20 or so countries. 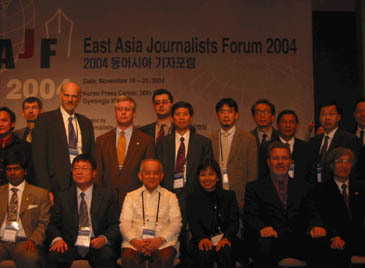 SEOUL, Nov. 22, 2004 — A new Asia-wide journalist organization has been launched as the first international media body to promote greater press freedom and solidarity among journalists in the Asia-Pacific region. 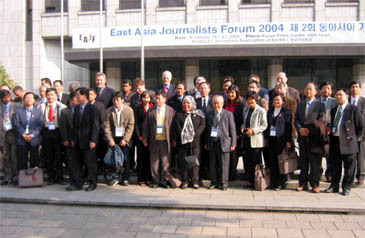 At the plenary session of the 2004 East Asia Journalists Forum, held on Nov. 19 in Gyeongju, Korea, participants founded the Asian Journalists Association (AJA). The six-day forum, which started Nov. 16 in Seoul and later moved to Gyeongju, drew some 60 journalists from about 20 countries including China, Japan, Malaysia, Indonesia, Vietnam, Singapore, the United States, Russia, Germany and Australia. 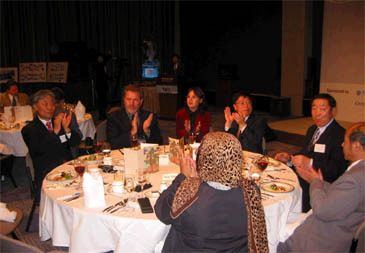 Participants unanimously selected Lee Sang-Ki, president of the Journalists Association of Korea (JAK), to serve as the new association's first president, and Kang Seok-Jae, chairman of the International Committee of the JAK, as its secretary general, according to the JAK, which hosted the forum. 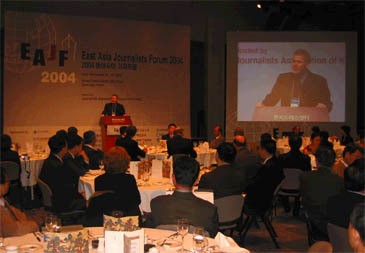 Christopher Warren (at the podium), president of the International Federation of Journalists, delivers congratulatory remarks during the opening ceremony of the 2004 East Asia Journalists Forum at the Korea Press Center in downtown Seoul Nov. 17, 2004. According to its charter, the AJA's highest decision-making body will be a General Assembly. The new association will also feature a 10-member Executive Council with one vice president from China, Japan, Singapore, Malaysia and Indonesia, with the final composition to be announced later this year. The headquarters of the AJA will be in Seoul, according to the organization's charter. Forum participants also decided to set up committees to tackle specific media issues that are relevant to the Asia-Pacific region. Committees to be established will address areas such as journalist safety and welfare, international exchange, professional development, and solidarity and networking. Over the last 10 years, several Asian countries have expressed an interest in establishing an Asia-wide international media association, but their efforts failed to materialize. In that regard, the JAK's successful efforts toward establishing the Asian Journalists Association as an international media organization are noteworthy. 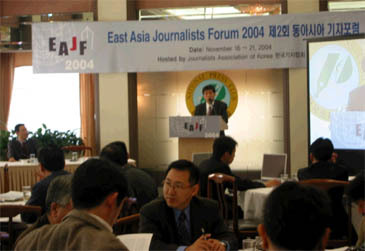 Kang Seok-Jae (at the podium), chairman of the International Affairs Committee of the Journalists Association of Korea, speaks during the first presentation session of the 2004 East Asia Journalists Forum at the Korea Press Center in downtown Seoul Nov, 17, 2004. China's admittance to the AJA is also significant as China has until now refused to join any non-socialist journalist organizations, such as the International Federation of Journalists, the International Press Institute, and the World Association of Newspapers. In addition, though not present at the Seoul forum, representatives of the Philippines, Laos and Sri Lanka each issued supportive messages, thus expressing their willingness to participate in the AJA. 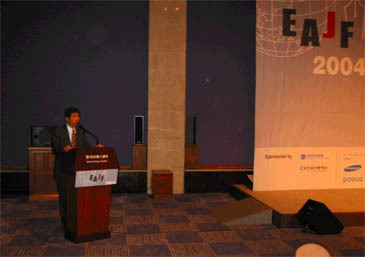 The Asian Journalists Association is being viewed as having set the stage for the era of a region-wide international media organization, in light of the interest expressed in it by Christopher Warren, president of the International Federation of Journalists, who was a keynote speaker at the forum, and the enthusiastic participation in the forum by such international media organizations as the Society of Professional Journalists (SPJ) of the United States, and delegates from Australia, Russia and Germany. "We have taken the initiative to launch an Asia-wide journalist organization to better safeguard press freedom and proactively deal with the changing media environment in the age of New Media," said Lee Sang-Ki, the first president of the AJA, in his acceptance speech. 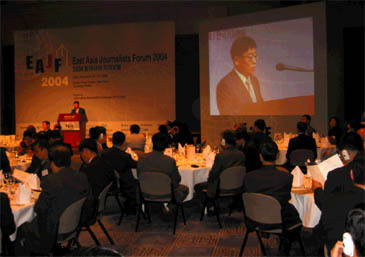 Lee Sang-Ki (at the podium), president of the Journalists Association of Korea, delivers opening remarks during the opening ceremony of the 2004 East Asia Journalists Forum at the Korea Press Center in downtown Seoul Nov. 17, 2004. Lee said, "I would also like to thank the SPJ, Russia, Australia and Germany for their full support for the launch of the AJA. I will do my utmost so that journalists around the world will, in 10 years, 20 or 100 years, forever remember the historic launch of the AJA today." Meanwhile, participants in the 2004 East Asia Journalists Forum unanimously adopted a "Resolution on Safety of Journalists," which seeks to address the increasing violence against journalists across Asia, most recently two Philippine journalists killed early this month. 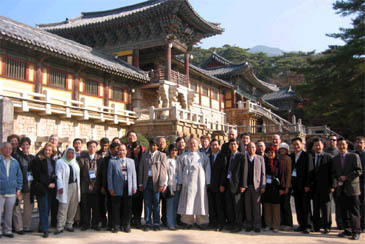 The participants also adopted the "Action Plan to Promote the 2003 East Asia Peace Initiative." The plan, drafted by Philippine Prof. Crispin Maslog of Nanyang Technological University in Singapore, calls for the development of peace journalism workshops, preparation of a manual on peace journalism and awarding of annual Peace Journalism Prizes.